Over two decades after its release, the horror genre was still being influenced by Alfred Hitchcock's 1960 classic PSYCHO. 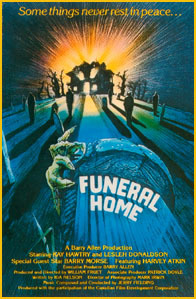 Among the more effective - if relatively unknown - efforts to pay homage to the Master of Suspense was the 1980 Canadian slasher Funeral Home directed by William Fruet. Fruet, who had directed the excellent revenge pic Death Weekend (also known as House By the Lake), helmed this Canadian production with the fetching Lesleh Donaldson in the starring role. Heather (Donaldson) has come to stay with her grandmother, Maude Chalmers (Kay Hawtry) at her house...an old funeral parlor that's been converted into a tourist home for the summer. The old woman makes fake flowers on the side that she sells in town - and is married to an undertaker who is missing. With no one to greet her at the bus stop, Heather is given a lift to the house by Rick (Dean Garbett). Maude happily greets her granddaughter. In answer to Heather's question, Maude tells the girl that her husband James just disappeared all of a sudden one day. Mentally challenged Billy Hibbs (Stephen Miller), a former caretaker for Mr. Chalmers, lives on the property. He now does odds and ends for Maude. The home itself spooks Heather, as it does other neighbors and residents in the area. A nearby farmer named Sam (Les Rubie) calls Rick's brother, Officer Joe Yates (Alfred Humphreys) over to his property...where he has discovered an abandoned vehicle under some hay. It turns out that it belongs to a missing real estate developer who was last seen trying to buy up land in the area. At Maude's place, there are new arrivals. Harry Browning (Harvey Atkin) and his tacky mistress Florie (Peggy Mahon) check in and meet Mr. Davis (Barry Morse), another guest. There is also an unseen person in the house. Maude's voice can be heard speaking with a man...who appears to be her husband. He tells her he doesn't want Heather around because she's liable to snoop. Florie teases Billy by coming onto him and then laughing in his face. When Maude realizes Harry and Florie are not married...she calls their relationship "immoral" and asks them to leave. The two have paid to stay through the weekend and refuse to listen to her. In the evening, the couple goes out for drinks. Intoxicated, Florie suggests they go to the local quarry. Maude's truck soon comes up from behind and pushes their car into the water below, killing them both. Returning from a date with Rick, Heather hears Maude speaking with someone in the basement. Her grandmother denies that such a conversation occured. By the morning, Heather has noticed that Harry and Florie are gone - to which Maude says, "Good riddance to bad rubbish." Maude drives Mr. Davis into town and notices him go into the police station. Meanwhile, Rick tells Heather that her grandfather was a mean alcoholic. He recalls the time when he was a boy and Mr. Chalmers locked him and a friend in the basement of the funeral home to scare them. While searching through the garage, Rick and Heather discover a Cadillac hearse belonging to the grandfather. It looks like it had been in a wreck. In addition, they find a necklace with the initials "H.D." Heather gets angry with Rick when he suggests that her grandfather ran off with another woman while Maude was being treated in a mental institution. Maude soon finds out the reason why Mr. Davis went to see the police. He has been searching for his wife and has reason to believe that she was having an affair with Mr. Chalmers. Maude angrily denies the affair and Heather overhears the exchange, including his wife's full name: Helena Davis. The name matches the initials on the necklace in the garage. Returning from a boat trip that night, Mr. Davis is brutally murdered with a pick ax and buried along with his wife's jewelry. And Heather finds the bodies of Harry and Florie, together with their car. As he inspects the vehicle, Officer Yates takes note of the fact that there is no luggage...which would be unusual if they had checked out of the tourist home. Billy is killed next. When Heather and Rick discover his corpse, they become targets. Rick is knocked to the ground and Heather discovers a terrible secret: her grandmother's dual personality. She has been keeping her deceased husband alive by speaking in his voice. William Fruet's direction is fluid - and the handsome production is aided by Mark Irwin's cinematography and simple production design courtesy of Susan Longmire and Roy Forge Smith. The classy score was composed by Jerry Fielding. A uniformly good cast makes Funeral Home an entertaining house of parlor tricks. Kay Hawtry is supremely efficient as Grandma, a delightful performance that colors Mrs. Chalmers equally interesting both in her cookie baking moments of wholesomeness, as well as her grand bouts of psychotic twitching. Of course, genre regular Lesleh Donaldson (from 1981's Happy Birthday to Me and 1983's haggy Curtains) is charming and natural in her starring role here. Donaldson fills her character with a polite and relaxed aplomb that belies a deeper goal...her Heather becomes an utterly real young teenager aghast at Grandma's secrets in the bang up basement finale. In fact, it might be a good time to point out how appropriately Donaldson represents this era. Both beautifully disarming and pleasingly nondescript, she possesses none of the cynicism and snarkiness that would so mar the genre in later years. An innocence in hindsight we won't - and can't - recapture. Unfettered by today's preference for sarcastic sneering, Donaldson is a breath of spring air...a breezy nonchalance that makes her reactions to the horrors she faces in Funeral Home that much more pure. And therein lies the overall strength of Funeral Home. Also known as Cries in the Night, Fruet's modest slasher is a simply executed riff on PSYCHO, buoyed by solid performances and a likable atmosphere free from self-awareness.